You’re working too hard. Selling your art was supposed to be fun, footloose, fancy-free-ee-ee. But instead you feel like there are never enough hours in the day and never, ever, ever enough time to create. You need to rethink your business model: how does the money come in the door? Is there a way to make more money with less effort? You bet your favorite knickers there is. I like to think of it as someone renting your art. A company or manufacturer will give you some money in exchange for using the digital image of your work on products – from wall calendars to lunchboxes to notebooks and jigsaw puzzles, even just canvas prints – that sell in retail stores, online and offline. It is! It gives you the chance to make one piece, sell the original, sell prints, and have the work printed on all sorts of things (you get to choose what!) with the money just rolling in! 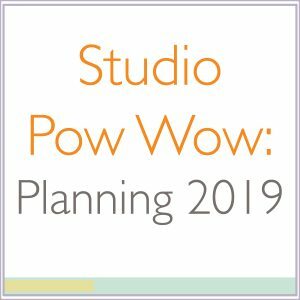 If you’ve dreamed you’d see your work on the cover of a notebook or patterned across your favorite designer’s new line of eveningwear, this is the easiest way to make it happen. So… Will that Work for My Art? Maybe not. Before I get you too excited about this pixie-dust form of making money from your art, we should clear up who licensing works for. Since the companies print your work onto products, they need a great looking digital image. This means 3D art just doesn’t work as well. All you ceramicists, jewelers, sculptors, and the like – this just got a lot harder. You can license your design to a company to mass-manufacture, say, candle holders in the same design as the bestselling ones you’ve handmade for years. But it’s tougher to find those opportunities. If you’re a 3D maker, and you really want to develop some licensing deals, it can certainly be done and Artistic License is the place to learn how, but it’s going to be hard. If you’re working in two dimensions, it’s a lot easier to start licensing your work. Almost any manufacturer is looking to license 2D art for some of their products. They’re constantly putting out new lines of scrapbook paper, bed linens, or car decals to keep their retailers buying. The need is there, and you’re about to fill it. One thing I hear artists saying is that they worry no one will want their art. But you don’t have to be a big name or have created a famous image (in fact, licensing is typically how an image gets famous in the first place). You just need to make art that people like to look at. Because companies are honestly just looking to sell more of their products. If your art will help products sell, they’ll be happy to have you. This isn’t really pixie dust. This is really real. There are artists making their entire income from licensing deals like Drew Brophy and Nicky Boehme, and artists using licensing to keep a steady flow of income while they also sell directly to customers like Natasha Wescoat and Sherri Ohler. According to the Wall Street Journal, Cory Carlson made $15,000 in royalties in 2012 and Mindy Sommers made 30% of her income in royalties, anticipating it would hit 70% in 2013 (I couldn’t find out if she hit that projection). This is a reality you could create, but it takes some work, and that’s where a lot of artists get lost because they jump in – toes first – and suddenly they’re in totally unfamiliar territory. Why Can’t I just Wing It with My First Licensing Deal? It’s so easy to end up regretting a licensing deal because you didn’t know the company was buying your art… and your soul. Contracts are confusing, especially when you don’t know what to look for and how to protect yourself. I’ve heard many a horror story of an artist accidentally selling their work outright, instead of for one or two years, and no longer being allowed to use the image on their own website! Or what about the artist who had a high-end brand and ended up licensing their work to a manufacturer who then sold the products to Wal-mart! That was a drastic hit to their luxe reputation. And other artists have reported spending thousands of dollars in legal fees when the contract isn’t holding up how they thought it would. Instead of creating your own disaster story, you can take Artistic License. It’s designed to teach you absolutely every little thing you’ll need for your licensing deals to go smoothly. This will fuel your income without a lot of added work and help you make more money from one piece since you can sell that piece as an original, a print, and a licensed digital image for use on products. But you can’t create this revenue stream for yourself unless you understand the steps it takes to get there. What is in Artistic License? 19 lessons and 3 video interviews with very specific instruction for getting a licensing deal. I walk you through exactly how to find an interested company and set up a mutually-beneficial deal with them. No drama. No stress. And lots of extra money. Included in the program are bonus sample materials like a sample contract and a sample introductory email to use when pitching a manufacturer the first time. This step-by-step process can explode your art business, giving you the revenue you need to keep afloat while you learn how to sell directly to the end-consumer who hangs your art on their wall. Instead of hustling for every single dollar, you can have a full-time income practically on autopilot. ”I first wasn’t sure if I should buy the course at this time already, since I am just restarting to create new paintings. But I was pulled to purchase by some greater force I guess. It just felt right. And tonight I just started the course and read through the first step: Interest Shown. So far I love the content! It’s exactly what I (for so long now) want to know. Selling/Licensing my artwork broken down into tiny tiptoe steps.” – Karolin L.
I’ve also included lots of resources in Artistic License like a printable vocabulary list you can have on hand as you read through the course (in case you keep forgetting if you’re the licensee or the licensor! ), examples of other artists who are licensing, an example of an effective pitch, examples of the initial negotiation process, and a fantastic sample contract. How Will I Get the Artistic License Lessons? 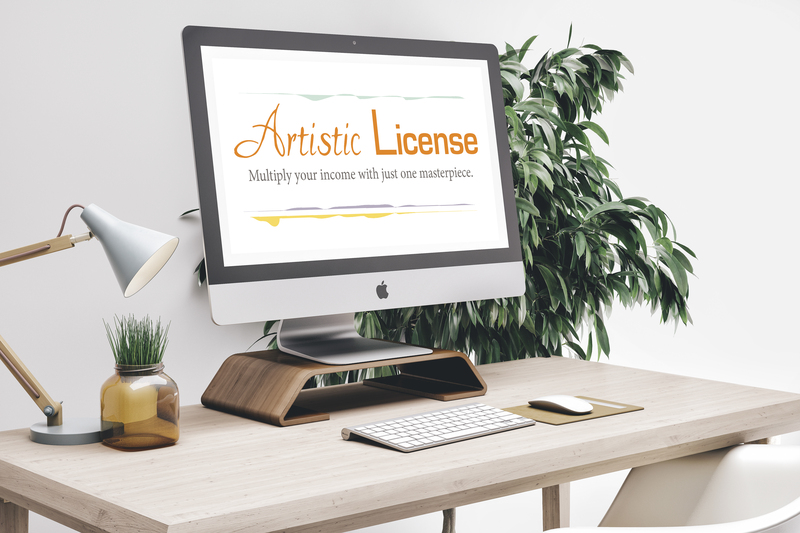 All the lessons and bonuses are accessible immediately through the user account you set up when you purchase Artistic License. All of the lessons are online, so you will be able to access them from any internet-connected device at any time. I want you to go at your own pace because everyone is in a different situation and has a different amount of time to dedicate to education. I don’t expect you to work through the materials on my schedule. Each lesson should take you somewhere between 3 and 10 minutes to read (with the exception of the videos which are between 30 and 90 minutes), but you’ll also want to take notes and look over the bonus materials. If you’re working alongside the course, you can get your first licensing deal started before you’ve even finished the lessons! You’ll want to set aside another 30 minutes to an hour per lesson to complete some tasks that reflect what you learned. So if you’re just learning, you can read through the course in about 3 hours (plus time to watch the video lessons). But if you want to implement as you read, it’ll take probably around 15 hours over the span of a couple weeks. I think the course works best if you read through it once, and then read through it again while you implement. Am I Ready to Try Licensing? You’ll have the best luck with licensing deals if you have a consistent style (though not necessarily a consistent medium) and have at least 2 small collections of work that fits together really well. This could be 3 colorways of the same pattern, 5 paintings that have lots of stripes in them, 10 illustrated Easter icons, etc. The goal is that you could hand a collection to the company and they would know on the spot that it works for their next product line, just as it is, or that you’re capable of producing several images on a theme – which is what works best for product lines. You’ll also have good luck with licensing deals if you know your target market really well and you have learned how to communicate in a timely manner. I can’t stress enough that artists need to act professionally, not flaky. If you’re ready for licensing, Artistic License could be the best way to get started if you’re also action-oriented, ambitious, and willing to put deadlines on the calendar and stick to them. Artistic License will put the power back in your hands to create the success selling your art that you’ve dreamed of – right where it should be. What an agent does for you is a) navigates the process for you because you don’t know how and b) saves you time by doing a good amount of the legwork for you. They’re also pretty expensive. If you don’t have time, an agent might be a good option, provided you have the upfront money to hire them. But if you do have time, you can save yourself the headache of working with another person and the cash by learning to do this yourself. Plus, you’ll look more professional to the companies you might license with because they are speaking directly to you so they know whether they can trust the artist to deliver. To Sell Out – In Artistic License, I teach from the point of view that you make your art. Licensing, in my opinion, is never about mimicking someone else’s style or creating what a company asks for without infusing your own style into it. You want an art business so you can create what you want, share it with the world, and get paid for it. “Selling out” isn’t about making money from what you do, but about compromising the integrity of your art in order to make money. And I’ll have none of that, thankyouverymuch. To Stress Out – Like everything you do in business for the first time, licensing can be a little stressful because you’re not sure what to expect. 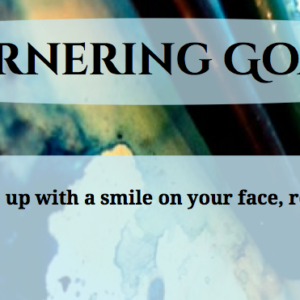 But I’ve outlined every step in detail for you to help curb your overwhelm. You’ll probably still be a little nervous, but I always want you to go back to steps and trust in them to get you that first licensing deal. I grew up a ballerina and in the dance studio you work at the barre and you work in “center”, the middle of the room. Whenever something’s wrong on stage or in center, if you just return to the barre it’s so easy to work it out. So whenever you stress out with your licensing deals, just return to the basic outlined steps in Artistic License and everything will work out. This program is designed to travel with you as a cheat sheet as you get more and more licensing deals. To Wait It Out – I will never ask you in Artistic License to wait patiently for someone else to discover you, do the work for you, or tell you if you’re making the right decision. This course is all about giving you the tools you need to take control over the licensing process and to know exactly what you’re getting into at every turn. Is Artistic License Going to Work for Me? If you’re still not sure about your particular situation, I’d love to talk to you about it via email. Just drop me a note telling me about your business and what you’re worried about and I’ll give you my honest opinion whether Artistic License will work for you or not. I’m not interested in selling this to artists who won’t get their first licensing deal from learning the material (and many more after that!). I want everyone who takes the course to be completely, 100%, jazzed up, ridiculously over-the-freakin-moon happy with it.